Window Cleaning Cardiff - CCWC Ltd.
Windows cleaning in Cardiff and in the surrounding areas is our specialty. Through the use of specialized facilities and chemicals, we are able to precisely and quickly remove dirt from the windows in office buildings, halls, shops and other facilities. Our Cardiff window cleaners will make sure that your windows will look as good as new, glass, frames and window sills. As a leading Cardiff windows cleaners we guarantee the affordability of services – we encourage you to take advantage of them when you need professional help! 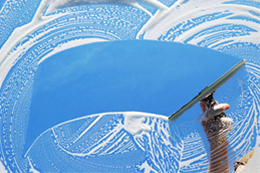 In our windows cleaning company, we are keen on providing high quality services. Therefore, if you need to wash the windows in Cardiff in your store or in office buildings, we are able to provide this service at the best level. The attention to cleanliness in the facilities of our customers is our top priority, so we make every effort to perform the service accurately and correctly. We get to clients throughout the capital city and the towns in its vicinity. Simultaneously with this affordable prices! We also offer building facades cleaning, not only windows cleaning in Cardiff – our company uses for this purpose special measures that remove dirt quickly and efficiently, leaving the site clean and sparkling like crystal. Window display is your business card and it should be your proud and joy – stained windows certainly will not encourage customers to enter and familiarize with the offer. We will make sure your window display will shine like a diamond compared to your competitors, Cardiff window cleaners will take care of even the tiniest spot and will leave your windows sparkling. Window cleaning services in Cardiff and the surrounding areas are done by using fast-acting degreasing, removing dirt and suitable crystalline radiance. The work also use proven tools and equipment. We are able to help even if services at an altitude – please contact us for further information. We provide affordable, individually tailored window cleaning in Cardiff. At Cardiff Commercial Window Cleaners Ltd we have over 50 years of combined experience; we are technically competent, affordable, approachable and pleasant. We also like to boast about our 95% retention of clients once they come on board. We have an 86% success rate with our quotes, we are VERY rarely beaten on price & more importantly quality. At Cardiff window cleaners we cover everything from High Street to High level window cleaning. All of our staff are; highly trained in all aspects of access equipment, uniformed, CSCS & PASMA Certified, IPAF licences holders & IRATA levels 1- 3 Abseilers. Health & Safety is of paramount importance to us in our industry; this is why we feel it important to gain our SAFEcontractor status and Constructionline accreditation, we are also associated with the Federation of Window Cleaners. We supply site specific RAMS which are automatically produced as a matter of procurement for contracts. We have fully comprehensive insurance of £5M Public Liability & £10m Employee Liability. In many cases the Eye bolt testing is hugely discounted or even FREE with ongoing maintenance cleans, something our competitors cannot offer.